Preheat oven to 350º. Rinse and spin or pat dry the kale leaves. Remove stems and spines and tear into bite sized pieces. Add oil and seasoning into a small food-quality baggie and toss until well coated. Lay in single layer on a parchment paper lined cookie sheet.
? 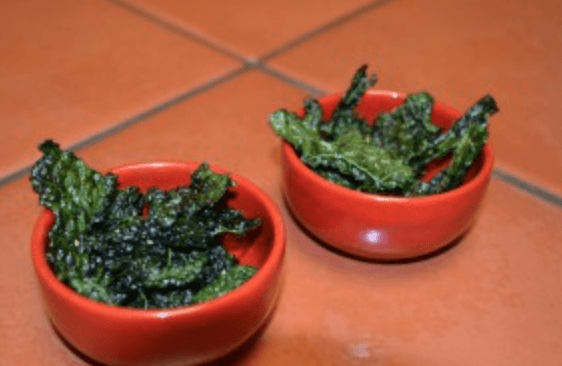 I use lacinato or italian kale (alligator skin, as my kids used to call it) because it is thick and has pockets to store the flavors of the seasoning.
? For a perfectly crisp chip, make sure the kale is WELL dried before it hits the oven.
? Feel free to spice it up! I use garlic on mine but find that dried garlic and herbs work better (fresh tends to burn easily).
? They cook quickly. Keep your eye on them.